Must not compress large instantaneous peak currents for any reason, either inductively (due to either the construction/layout of the conductors or inductors) or resistively (due usually to gauge). The cord needs to be shielded from RF (Radio Frequency) interference, and a means of sinking,shorting or otherwise disposing of that energy is necessary. If there is no power filtering ahead of the power cord, then it must have some capability to filter incoming power itself in order to provide the cleanest power possible in every circumstance. It should be flexible, of reasonable thickness, and reasonable to use. This is not just a matter of practical ergonomics. A stiff fire-hose of a cord will bridge vibration noise past isolation bases and other quieting devices placed under equipment, rendering them less effective, if not pretty much ineffective in the worst cases. There are, typically, miles and miles of power wires between you and the power stations. By the time the power reaches you in our electricity-and electronics-dependent world the power is thoroughly polluted with noise from thousands, if not millions, of devices with motors, switches, and other devices or circuits which put every manner of electrical noise back into the lines that power them. Our atmosphere is polluted nowadays with an amazing variety of radio frequency/microwave noises (RF), and the power distribution net is, in effect, millions of miles of antenna that picks up this pollution, too. You can’t hear these frequencies directly, but they do affect your electronic equipment negatively, and the results are usually audible in their effects on the noise floor of every piece of gear you have. Electrical and RF noise also have more direct negative effects upon your digital equipment. Even your digital equipment itself can affect other equipment in your own system negatively, as most digital equipment is known to put some high frequency noise back into the power line. This noise needs to be filtered out for best sonic results, and the cleaned power needs to be delivered clean, without picking up new noise on the way to the equipment it serves. 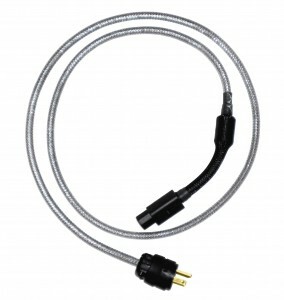 Power filters are an audiophile necessity nowadays, but they cannot deliver that power in perfect condition if the cord picks up fresh noise along the way to the equipment, as is the case with most power cords. The Empowered Cords are built from flexible, user friendly 14 gauge wire. The cord starts with a high quality (wall) plug with enough room to include three small capacitors inside, a metalized-film type, and two Vishay HV ceramics. The reason for good plugs is obvious. They are needed to make a good, solid, dependable connection. Beyond that, there is a limit to what an exotic diminishing-returns plug can do after miles of wire and a large number of non-audiophile grade wire junctions along the way. These plugs were chosen for their sonic performance/value rather than hyped glamour and every one is hand-polished and treated (both inside and out) with contact preservative. The capacitors filter the incoming power without any transient-suppressive losses, right at the plug. They also stop equipment-originated digital noise from going the other way and reaching your other equipment. Then, the cord is shielded with a mildly conductive but non-transient-suppressive Mylar-content braided cover that provides a “path of least resistance” to the RF. The attractive cover is not conductive to the touch, and is connected to the plug’s ground with a ground drain in order to “sink” the noise the shielding cover stops. At the other end, the shielding cover ends a few inches short of the IEC plug to guarantee that RF cannot jump the gap to the equipment. This also spaces the Ferrite away far enough from the carefully chosen and contact-surface-treated IEC connector to allow the cord to bend easily at the back of the equipment in order to avoid a wall or cabinet back. Included inside the IEC is a hi-tech RF absorptive paper, ERS, to further strip away noise. A special low frequency-capable Ferrite caps the end of the shielding cover to stop any RF from passing that way. There are many types of Ferrite formulations, and the ones most commonly seen are meant to operate at much higher frequencies than are optimal for audio. The result of the construction of the Empowered Cords is a flexible, easy-to-use power cord which cleans up the power it carries and keeps it clean and RF free. While it is not a substitute for serious megabuck power filtration, it will deliver an audibly cleaner noise floor, with the attendant improvement in dynamics this gives, and a cleaner, crisper soundstage and depth. The user-friendly flexibility avoids the problem of “bridging” or carrying vibration into equipment, which stiff cords will do, right past any isolation devices under the equipment. Empowered Cords impart a sense of cleaner effortlessness to all equipment, and just powering a piece of digital equipment with one automatically puts a measure of noise isolation between it and the rest of your equipment as the filtration works in both directions.